Tennis Server - Tennis Warrior - Are You Having a Bad Week of Tennis? Are You Having a Bad Week of Tennis? When players have a good week of winning they come to their lesson exuberant, motivated and ready to train. But then when they have a poor week of tennis they drag into the lesson deflated, depressed and unmotivated to train properly. These two scenarios play out over and over again on tennis courts around the world. In the second scenario, players allow their emotions to dictate to their mental attitude, and then let their mental attitude dictate to their body. Their discouragement demolishes the possibility of a good training session. A losing streak is the time to begin the intense training that is critical to regaining an edge, but oddly enough, human nature does just the opposite! Let me dissect this "opposite phenomenon" in the hope that you will be alert to this pitfall and avoid falling into counter-productive thinking. Here is the story. 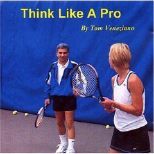 Once a player has a lousy week of match-play tennis he or she then finds him or herself reluctantly heading to the courts for practice. Two patterns of thinking dominate. The first pattern is depicted by the whining, "I'm so down, I don't feel like training. What is the purpose of more training anyway? Look at that disaster last week!" This is the typical "Poor me! I work so hard and I just can't catch a break" mentality. You now are a victim. You practice hard, yet nothing goes your way, so you're off balance, dizzy with failure. Two weeks ago you were a sensation, but that memory has vanished. All is lost! In this scenario the player continues to train, but he or she trains halfheartedly, only giving 60 to 70 percent effort. In this pattern, the player comes to the lesson disheartened from a loss but motivated to vigorously overhaul his or her game and fix it now! He or she comes on the court, giving 110 to 120 percent effort, thinking they will miraculously solve all their problems and feel better about themselves. By this rationale, if the player can try extra hard their game will improve, then they'll feel better and nullify last week's losses. On one side we have a player who becomes lethargic and unmotivated, on the other side we have one who becomes overzealous. Either way, each player is immersed in an emotional reaction to their losses. This emotion dominates the player's thinking and produces a poor training session. To avoid these pitfalls you must first be honest with yourself and be aware of thinking incorrectly. How do you know when you are incorrect? Simple! After the bad week you will head to the courts to practice, but you will have no desire to work your normal training program. Instead, you will feel like you should do something different. At this point you must recognize you are off track. 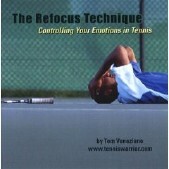 Once you recognize that you are mentally going off track, you must then override your emotional thinking with Tennis Warrior principles. In this case, the "Champions Do the Opposite" principle is your answer. You quickly shut down your emotional, counterproductive thinking and do the complete opposite of what you are feeling. You continue your normal training program, and by the end of the training session you are back on track and advancing with stability and focus. Tennis Warriors and Champions are masters at neutralizing a negative external environment by creating a positive internal environment and stabilizing the situation. You will never be a victim of emotions or circumstances, but you will be victorious with a stalwart mental toughness of a Tennis Warrior.